The Foyer (Main Hall in PAL regions) is a room in the Gloomy Manor in Luigi's Mansion: Dark Moon. This room can be accessed by going into the north door of the Guard Hall. The Foyer is a large, two-story room with a fountain in the middle. There's an aquarium on the second floor that can be lowered by using the crank on the bottom level and a chandelier that can be lowered by using the Poltergust to blow the fan to spin it. The lower-right door on the bottom level leads to the Coatroom while the door on the left wall leads to the Common Hall. The Foyer can be accessed from Under the Stairs, but it will just take Luigi to a dead end. The northern door on the second level will take Luigi to the Lobby while the door on the left will take him to the Master Hall. During the first mission, Poltergust 5000, Luigi will first visit the Foyer to obtain the Strobulb that a pair of Greenies have stolen from the Poltergust 5000 by blowing on the fan with the Poltergust. In Gear Up, Luigi goes to the Foyer to activate the crank that grants him access to the library. However, four Slammers remove four gears from the mechanism and Luigi must hunt them down before he can utilize the crank. 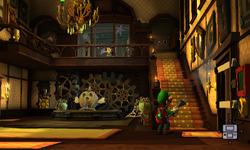 In Quiet Please!, Luigi uses the crank to lower the aquarium that leads to the Lobby. Various types of ghosts will ambush Luigi during some of the other missions in the Foyer. From A-3 onwards, Luigi can obtain the Star Amethyst by accessing the Foyer from Under the Stairs via the Patio. This page was last edited on February 28, 2019, at 18:15.